A rather cheerful and bright anime to watch, Acchi Kocchi delves into the cute and innocent lives of a group of high school friends as they go through life together in many happy and humorous ways. It may seem that this anime will be all lovey-dovey, sappy and cliched dialogue at first glance; but I can tell you that it is absolutely not. Not in a sense that would make you shirk away in disgust, but rather it will make you smile at the cuteness and innocent interactions that these characters have. This in turn makes a pleasant love story that will warm your heart and make you happy all day. The story is quite simple to follow as it doesn't involve much action or adventure that many anime pursue. Rather, it can be said as a typical slice of life anime that follows the lives of the characters around, with extra comical elements and melt your heart moments that makes you go "aww". Also, the story tends to subtly bring in many cat phrases, actions, and cute sounds. The art was simply illustrated and animated. Although it was plain and simple, it suited the characteristics of the anime beautifully. You can instantly tell that this anime will be a cute and innocent anime just by looking at the chibi-esque form that the characters take. The anime also uses a special symbolic meaning to each part of each episode through the use of arrows; which was quite interesting I thought. The voice acting suited the characters really well and reflected each and every character's personality perfectly. I must also mention the use of background music in nearly every scene which was subtly playing in the background. I felt that it was well selected and suited the situation perfectly. The theme songs were also sweet and peppy (which suited the anime of course). Everything about the choice of music just sounded right. The anime is constantly about the relationship that Tsumiki and Io have. What makes it interesting to watch is that Tsumiki is a dandere character that gets easily embarrassed a lot (she does have quite a few tsundere moments, but she is a typical dandere character), whereas Io is a complete dense guy which doesn't realize Tsumiki's feelings for him. Of course though, he finally realizes in the end (somewhat) and they both have a nice relationship. Overall, I would say that this was one funny anime to watch. The romantic element was not dominant in this anime in a way that would ruin a good story or make you turn away in disgust. The characters were all presented just right, and the overall compilation of the anime was perfect. I had no problems or annoyances at all in the anime. It was a pleasant experience to watch. 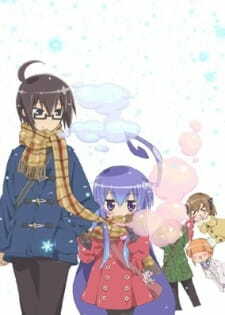 It was a simple story to follow and the romantic comedy elements were integrated well in the anime. Although it was simple and plain, it suited the anime quite well. The anime ha got the voice acting and music selection just right. No complaints here. Cheerful, peppy, and full of life. Just wonderfully presented and will make you instantly like them a lot. The comedy elements were genuinely funny and the romantic elements were quite good. Simply a light and wonderful anime to watch that will simply melt your heart (even if you may have a cold one).